Fiat G.50, MM.4961, flown by Maggiore Giovanni Buffa, Commanding Officer of 21° Gruppo Autonomo C.T. ), Naples-Capodichino, September 1940. Three-tone scheme of Green and Brown blotches over Sand background. Light Grey lower surfaces. National insignia on white background under the wings and lacking above. This typical tail cross style, of wide design and extending across the fin, was distinctive of all aircaft built by CMASA. The mount of the Group Leader could be detected by the ordinal group number in black, displaying also an appropriate command red-blue pennant on the fuselage, complete of a yellow flagstaff. Worth of note is also the old Stormo badge still displayed on the fuselage, representing a red howling wolf in a black disc. That insignia was distinctive of the Stormo since the foundation, being the same of 52° Stormo, but having reversed colours. Anyway, it should have been soon replaced by the new and more popular one with the cat and the green mice. Fiat G.50 of 356a Squadriglia (21° Gruppo, 51° Stormo C.T. ), Ciampino Sud, February 1940. Three-tone scheme of Green and Brown blotches on Sand background. Lower surfaces Light Grey. This being one of the first aircraft from second production series, characterised by an open canopy and a balanced rudder. 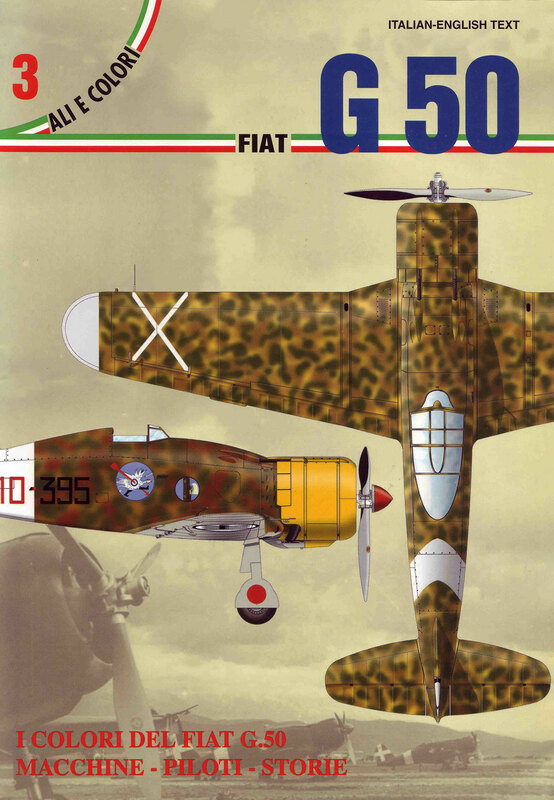 It’s interesting to note that starting from this production batch a slightly different camouflage scheme was adopted, differing mainly as it used same darker colours (Verde Mimetico 3, Marrone Mimetico 2 and Giallo Mimetico 3) already used by Aeritalia for Fiat CR.42s, probably adopted to standardise colours used by Fiat Group’s factories. The meaning of the red solid disc carried on wheel covers almost every single G.50s of early production batches is unfortunately unknown. The arrival of G.50s to 21° Gruppo completed the equippement of 51° Stormo, purposely formed to be the first unit armed with the new monoplane fighter. Fiat G.50 of 356a Squadriglia (21° Gruppo, 51° Stormo C.T. ), Naples-Capodichino, June 1940. Standard three-tone scheme of Green and Brown blotches over Sand background. Lower surfaces Light Grey. National insignia carried in black on white roundels underwing, but lacking above like all other planes of early CMASA production series. Plane was already carrying the white Savoy cross on tail, replacing the national rudder stripes soon after Italy entered the war. The howling wolf Stormo badge was carried under the cockpit. Traces of overpainting can be noted under individual and squadron codes, possibly indicating this aircraft had been previously assigned to another squadron. 356a Squadriglia had been based at Ciampino since its forming in 1939 and, in view of the imminent war declaration, on 3.6.40 it was posted to Capodichino to defend the city of Naples, where it got autonomous status till when it was reunited to the rest of the Gruppo on 4 August, later receiving new Macchi C.200s in September.